Stash is an odd little thing to me. On the one hand, it is pretty awesome to see a pattern I want to make, go to the stash, find the yarn, and cast on. I can pet the pretty yarns whenever I want. 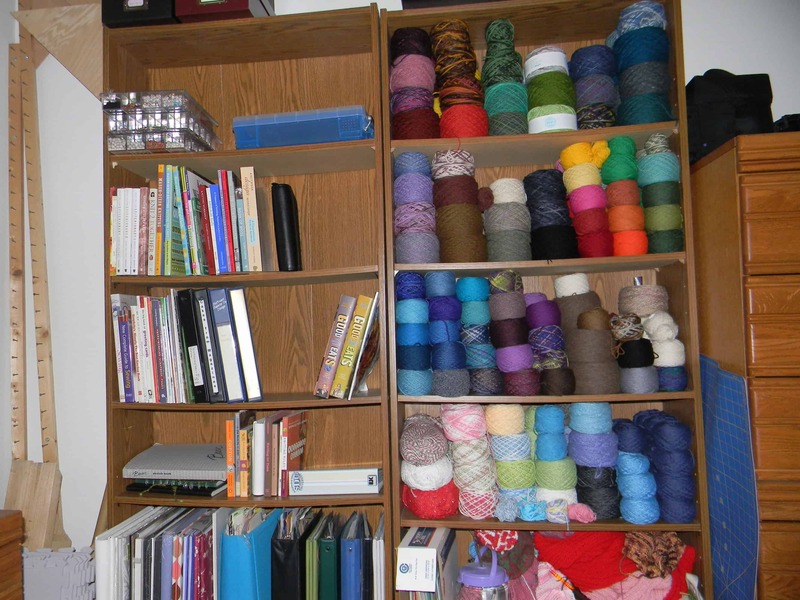 Most mornings, I wake up facing the shelves of yarn, and the cheery colors make me happy. On the other hand, many of these yarns were purchased for specific projects that I have not made. These yarns represent what David Allen, author of Getting Things Done, calls “open loops” — mental obligations that split your focus from the task at hand and make you feel like you should be doing something other than what you are currently doing. Many of these yarns were purchased right after I returned to knitting after my post-dislocated-finger hiatus, and before I knew what kind of yarns I would use most. I bought them because they were inexpensive or offered the most yards for my buck, without tuning in to the weight of the skeins or the quality of the fibers. Maintaining a stash is work. Yarn can get dusty, and god forbid moths get into your stash and eat up all your precious pretties. I have had moths get into my house, and now all my animal fiber yarns are stored in Ziploc bags on these shelves, so they are nowhere near as pretty to look at as they were when the above picture was taken. Somewhere on this continuum of reasons to love my stash and reasons to feel stressed by my stash is a mythical perfect point where the stash makes me happy with little stress. Right now, I’m not at that point. Most of the time, when I look at my yarn, I feel the stress of obligation and waste. So I decided that 2014 would be a year of reducing stash. I would not only look to stash first for all projects, but I would actively seek out projects to reduce the stash. My goal is to have 10% less in my stash on December 31, 2014 as I did on December 31, 2013. That comes out to reducing my stash by 9,383 yards (5.33 miles). I did not restrict myself from buying yarn, but know that if I do buy yarn, I have to knit through an equal amount of yardage as I bought, in addition to the 5.33 miles I must knit to meet the goal. I have an accountability partner through the Ravenclaw Tower Ravelry group (this group is a spin off of the HPKCHC group; each of the 4 canon houses has its own Ravelry group, referred to as the Common Room for that house). We check in with each other once or twice a month to see how we are doing with our goals. I also made myself a spreadsheet and Ravelry project to track my stashdown progress. During the first three months of this year, I did a lot less crafting than I had in fall of 2013, due to the wrist injury. I did not obtain any new yarn, though, so I was making progress, even if it was slow. In those three months, I knit my way through about 1800 yards (1 mile) of yarn. Excellent! But then, there was April. April, in which I went to The Fiber Event and the Florida Sheep, Wool, and Herding Dog Festival. I did not buy a lot of skeins of yarn, but the yarns I bought had a lot of yards. I also received yarn as gifts (and my stashdown goal makes no exceptions based on how the yarn was obtained) and spun my first yarns. When I ordered a tensioned lazy Kate and extra bobbins from Knit Picks, I also added a dozen skeins of the discontinued Felici self-striping sock yarn to the order. I already met the $50 minimum for free shipping, so why not? (The other side of the “I need a few more skeins to get to $50 and free shipping” argument. We can all justify the purchase of yarn at any time!) All told, I acquired 10,061 yards (5.71 miles) of yarn in April, effectively doubling my overall knitting obligation for the year. I now have to knit 11.04 miles of yarn in 2014 in order to reduce my stash by 10% from the December 31, 2013 level. And this obligation will increase as I turn all the fiber I purchased into yarn over the course of this year. I do not count yardage towards stashdown until the project is complete. All the seams sewn up, the ends woven in, blocked, whatever. The knitting or crocheting must be complete and ready to be used for its intended purpose for it to count towards stashdown. This means that something like the granny squares, for example, are not yet counted as stashdown. Once they are assembled into an actual blanket and the ends are all woven into the blanket, then they count. Projects count in the month they are completed, regardless of when they are started. May was a fantastic month of stashdown progress! Even though I went to Maryland Sheep and Wool, I did not increase my yarn stash. I only bought fiber. I also crafted my way through 1,977 yards (1.12 miles) of yarn, not including the granny squares. This is fairly close to the level of crafting that I will need to maintain throughout the rest of the year, if I am to meet my goal of 10% reduction. It is theoretically possible that I will meet the goal, but it is a tight thing, and I will need to be disciplined if I’m going to do it. Now that you have the background on my stashdown plans, I will include my stashdown progress in my monthly wrap up posts, so you can see whether I’m making progress towards my goals. What about you? How much stash do you have? Are you happy with the size of your stash? Do you wish it was larger or smaller? How much larger or smaller? Do you have goals to reduce your stash? What are they? Drop a comment either here or in the Through the Yarny Curtain Ravelry group and let us know!